Haunted by an ancestor’s tale of near death on a distant battlefield, James Carl Nelson set out in pursuit of the scraps of memory of his grandfather’s small infantry unit. Years of travel across the world led to the retrieval of unpublished personal papers, obscure memoirs, and communications from numerous Doughboys as well as original interviews of the descendents of his grandfather’s comrades in arms. The result is a compelling tale of battle rooted in new primary sources, and one man’s search for his grandfather’s legacy in a horrifying maelstrom that is today poorly understood and nearly forgotten. The Remains of Company D follows the members of Company D, 28th Infantry Regiment, United States First Division, from enlistment to combat to the effort to recover their remains, focusing on the three major battles at Cantigny, Soissons, and in the Meuse-Argonne and the effect these horrific battles had on the men. 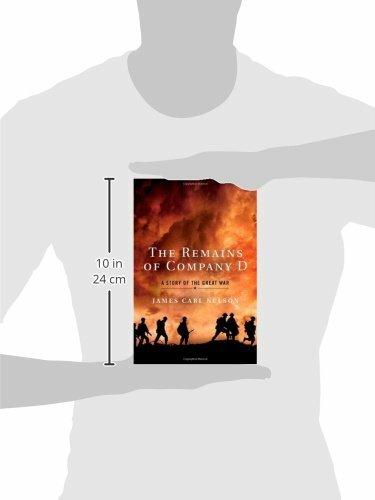 This is an important and powerful tale of the different destinies, personalities, and motivations of the men in Company D and a timeless portrayal of men at war.